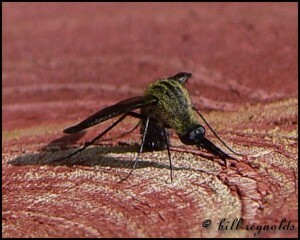 The hunchback bee fly (Lepidophora lutea) is a medium-sized bee fly with a distinctly hunch-backed appearance. It is fairly common and widespread in eastern North America. It’s unusual shape mimics the robber fly. The larvae are kleptoparasitic, eating the collected food in the nests of solitary wasps, and possibly also parasitic, eating the larvae in the host’s nest. 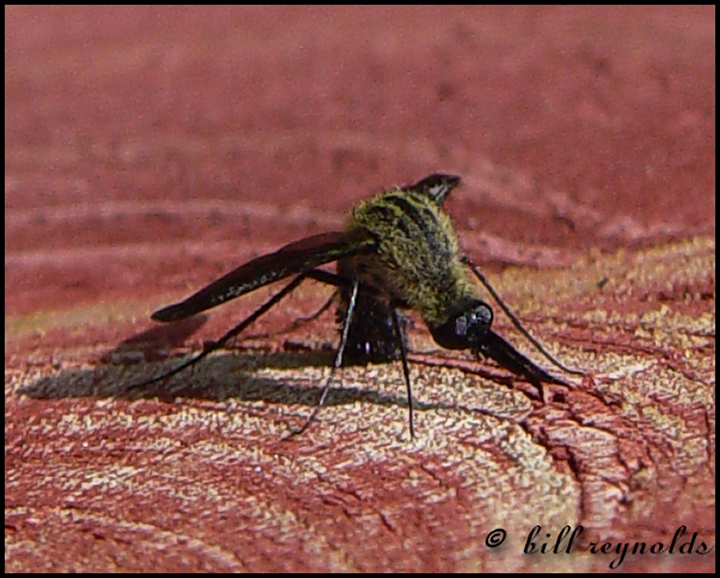 This entry was posted in Insects and tagged hunchback bee fly, Lepidophora lutea on July 29, 2014 by John Valo. 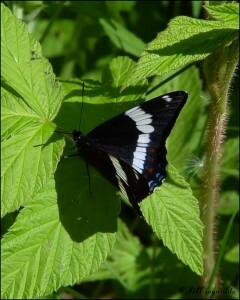 White admiral (Limenitis arthemis arthemis) is a common, large, brush-footed butterfly. In is found in forest edges and openings, on trails, and on roadsides. It is often seen sunning itself on gravel roads. Caterpillars are found mostly on birch, willow, quaking aspen, and chokecherry but sometimes also on other trees. Adults feed mostly on sap flows, rotting fruit, aphid honeydew, carrion, and dung, rarely on flower nectar. 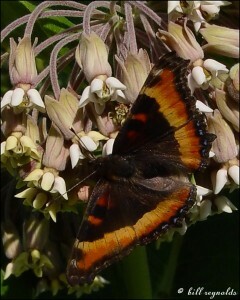 The appearance of this butterfly is distinctive and there are no similar butterflies in Minnesota. However, the range overlaps that of the red-spotted purple in the lower third of the state. Where the ranges overlap the subspecies interbreed and produce offspring with intergrading characteristics. This entry was posted in Insects and tagged Limenitis arthemis arthemis, white admiral on July 25, 2014 by John Valo. Plains prickly pear (Opuntia macrorhiza) is one of only three cactus species found in Minnesota. It is diminutive, hugs the ground, and has flattened pads. It looks nothing like the other two cacti, brittle prickly pear and ball cactus. It is common on dry, rocky or sandy prairies, dunes, and lakeshores in the southwestern part of the state. Large, showy, bright yellow flowers appear from mid-June to July. They are replaced by fleshy, juicy, red fruits, which mature from mid-July to mid-September. The pads become wrinkled with the approach of winter. 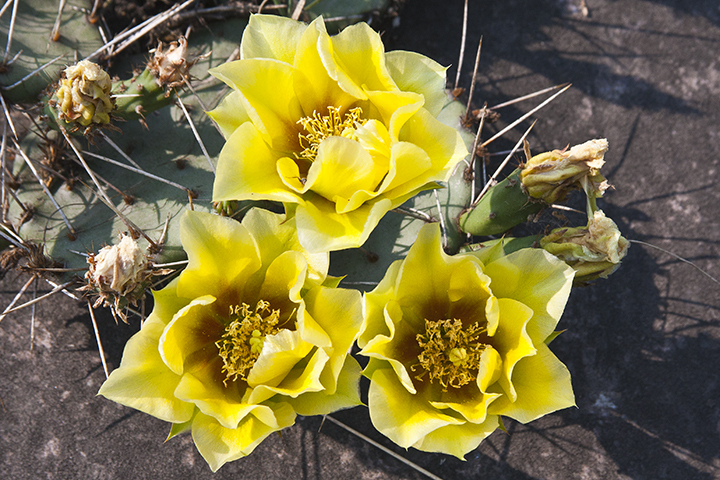 This entry was posted in Plants and tagged Opuntia macrorhiza, Plains prickly pear on July 20, 2014 by John Valo. Milbert’s tortoiseshell (Aglais milberti) is a fairly common, medium-sized, brushfooted butterfly. It is found in woodland openings, open areas near woodlands streamsides, trails, and roadside ditches. In Minnesota, stinging nettle is the only host plant for the caterpillars. There are two broods each year. Adults of the second brood hibernate, sometimes in groups, in bark crevices or on human structures. When they emerge from hibernation in the spring they are pale and appear tattered. This entry was posted in Insects and tagged Aglais milberti, Milbert's tortoiseshell on July 19, 2014 by John Valo. Eastern hemlock (Tsuga canadensis) is rare and imperiled in Minnesota. There are only 10 known sites in Minnesota where the tree occurs naturally (not planted). This is a long-lived tree, lasting 500 years or more, but it is very slow growing and it seldom regenerates. The root system is shallow, which makes mature trees vulnerable to windthrow. Young trees are vulnerable to deer predation. Old trees are vulnerable to beavers, which sometimes girdle hemlocks to kill them and make room for more desirable trees. The species is also susceptible to the invasive hemlock woolly adelgid. Hemlock woolly adelgid commonly causes 70% to 80% mortality, and sometimes 100% mortality, among the hemlocks in forest stands in New England. 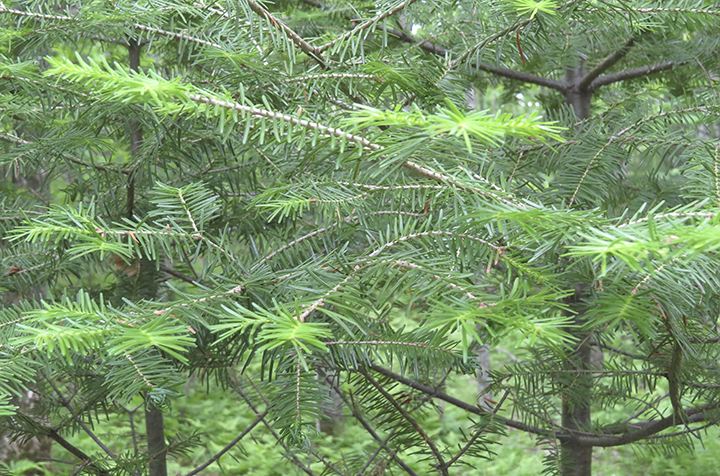 This entry was posted in Plants and tagged eastern hemlock, Tsuga canadensis on July 3, 2014 by John Valo.